Do you know which president first pardoned the Thanksgiving turkey? Or why Armistice Day is now called Veteran’s Day? If the questions like these, and the history behind our nation’s holidays interest you, and you want your children to learn how these holidays have shaped our culture, the White House Holiday Unit Studies from Silverdale Press LLC will be a good fit for you. I was thrilled to receive them to review! Each unit study came as a downloadable PDF, with an additional file for answers. I appreciate this format for unit studies, as I can print exactly what I need and not everything, and don’t have to worry about losing something important since it’s right on the computer if I need it again. Each unit has 3-5 lessons, with several activities. These focus on the history behind common holidays, and how the White House (and various Presidents) played a role in the formation of that holiday. There is a section of each lesson to read aloud to the family. Designed for students in K-6 or 7-12, everyone can benefit from the read aloud. Then the activities are broken into the two age bands. The older children go more in-depth in their studies, while the younger kids have a more age-appropriate study. At the end of each lesson, there are Internet links recommended for further study or research in the “Explore Further” section. Some of these included videos, and there were also articles. The unit studies include primary source documentation, so you don’t have to search all over for the correct speech or document. There’s also a breakdown of credits for older students. These unit studies are thorough, covering a variety of subjects. Since none of the holidays fell during the review period, we did more of an overview of all of these units, moving quickly through each in a week. We explored some the lessons, listened to some of the read alouds, completed some activities, and planned what we’d like to do as we revisit each around the time each holiday falls. We had a great time learning a little more about each holiday. And the activities were fun. Here’s a paper poppy pin one of the kids made, and a valentine another did. (This has a quote from Ronald Regan except instead of saying wife, it says Grandma!) The study recommends passing these out with jellybeans, Ronald Regan’s favorite candy. We may do that in February! It was nice to have a unit study that everyone could participate in. Usually it’s a challenge to find something that engages both my preschooler and my high-schooler. This, however, was interesting and well done. I was surprised at how much I learned from these studies! The history of holidays and how they impacted our culture isn’t something that’s really taught in public schools, so a lot of this material was new to me. I found it fascinating, and I can’t wait to dive into these studies more in-depth as each holiday approaches. I loved the amount of content in each study. They wove together primary sources, an engaging narrative, and plenty of hands-on activities. There were cooking projects, crafts, links to audio files to listen to, research ideas, and more. No matter the learning style of your child, there’s something here that’ll fit. 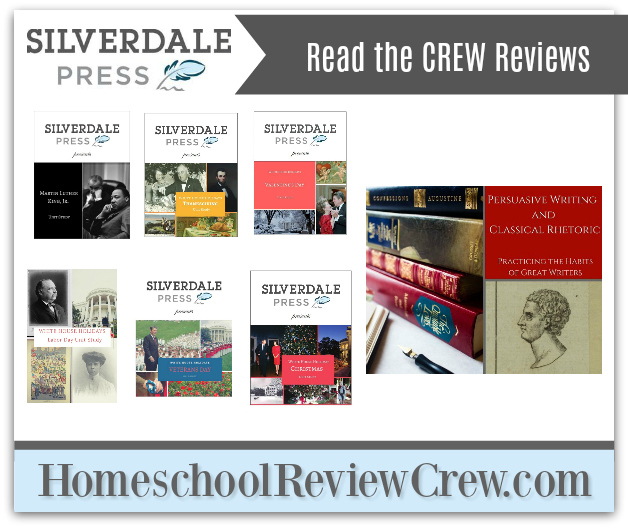 To see what other reviewers thought of the White House Holiday Unit Studies, or the Persuasive Writing & Classical Rhetoric high school curriculum from Silverdale Press LLC, please click on the banner below.